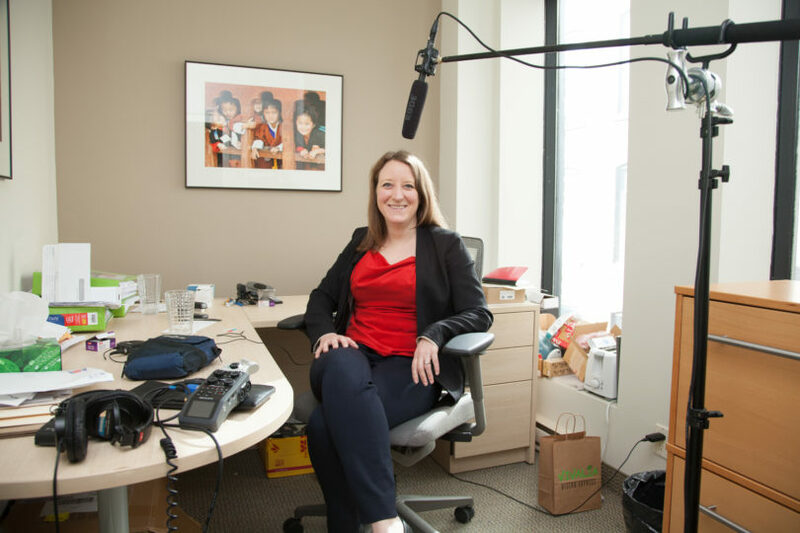 Audra Renyi is the Executive Director of World Wide Hearing, a non-profit organization that provides access to affordable hearing aids to children and youth in developing countries. Renyi: I really wanted to be an actor. I loved theatre. I loved getting in front of people and being different people, and putting myself in the shoes of other characters. In a certain way, that’s come true later in life. I do a lot of speaking and presentations on stage and I always really enjoy that because it brings me back to when I was in school and I was acting. What did you end up becoming? Renyi: I ended up going into finance, quite a shift! I studied business and finance at Wharton, and also did a bachelor’s in international studies. I ended up working as an investment banker on Wall Street, of all places. I also spent two years volunteering in Africa with different organizations like Doctors Without Borders, the One Acre Fund, a microfinance fund. We worked in Rwanda, Chad, Kenya. Then I came back to Canada — to Montreal. Claudio Bussandri founded World Wide Hearing Foundation International in 2011 and hired me to set it up and run it. Can you describe the scale of the problem – and the complexity of the problem that you work on? Renyi: There are 1.3 billion people with hearing loss worldwide — 360 million of them have disabling hearing loss, which means they just can’t operate normally in a situation without amplification or some kind of support. Of all those people, 180 million are children. Most of them live in developing countries, and almost none of them have access to the hearing aids they need. There’s a huge gap in the access to assistive devices like hearing aids, and also a lack of trained personnel to actually fit the hearing aids. You could give Guatemala 100,000 hearing aids tomorrow, and most of them would sit in boxes. There are just not enough people to fit them. There’s one audiologist for the whole country, who actually happens to have been trained at McGill University. That’s it. Honduras, next door, has no audiologist. It is a major issue. How can social innovation make a dent in that? Renyi: One thing I didn’t mention is that price is also a huge barrier — the price of the hearing aids. The average hearing aid right now sells for up to $2,500. That’s a huge barrier to access for most people in developing countries. When we think about social innovation and how social innovation can address this, what I find really interesting is that this is not a sectorial problem, it’s a combination of things. How do you use the best of business efficiency to address a global social problem? It’s not just because something is new and cool that it’s better. Sometimes the things that have been done for a very long time, and have been done well, also deserve attention. In our team at World Wide Hearing, we bring together people from all different kinds of professional backgrounds — from people in the business world, to people in the sciences, to people who’ve had a lot of experience in developing countries with humanitarian aid organizations. It’s putting together all these different points of view to solve this major issue. You need, in some ways, a simple solution with a lot of complex thinking behind it. Our programs have always been focused on sustainability. How do you train local people, create local capacity — technician-level people — to fit hearing aids? How do you make sure that they can continue to do that when there’s no more grant money? That’s why it’s really important for us to build a sustainable business model where they’re charging something for the hearing aids. It’s a subsidized cost, but that allows them to generate ongoing revenue. These are the kinds of things that we think about as an organization. What, in its essence, is social innovation? Renyi: For me, social innovation is taking innovative approaches to really crack a social problem. And those approaches in themselves are not unisectoral. They bring together all kinds of different fields. And it’s really about how do you address a social problem? Nowadays, everyone wants to think outside of the box, everyone wants to bring in new and effective approaches. Is there something different about this social innovation movement specifically? Renyi: I think the social innovation movement, where it’s different — it’s sort of upending things sometimes, and saying, what if we looked at this problem in a different way, if we got out of a traditional mindset of, for example: “We’re a charity and charities always do this in a certain way,” or, “We’re a business and we always do this in a certain way.” Take a step back and say, what can we learn as a business from the charity, and what can we, as a charity, learn from the business? And how can we cross-fertilize some of these disciplines and work together? For me, collaboration is a key piece of that. I think that what you’re seeing more and more of is this idea of NGOs collaborating with businesses, because often social enterprises and NGOs are really good at serving people at the grassroots level, which businesses often don’t know how to do. What businesses are really good at — multinationals in particular — is scale, in a way that NGOs and social enterprises really have trouble with. Is there something different about the social innovation movement, and if so, what is it? Renyi: What you’re seeing more and more in the space of social innovation is collaboration. I think that’s a key part of social innovation. I’m a strong believer that if you really want to change the world, we have to all work together. Both internally, within the firm, and externally, with partners. Experimenting is also really key. It’s one of the key parts of social innovation. Without trying new things, you just won’t get there. And trying new things means failing sometimes. Failing a lot sometimes. But, as they say, failing forward so you’re constantly learning from your failures, and integrating those learnings, and improving. Taking a risk as an organization sometimes means saying, “Well, what if we did this differently? What if we did this better?” Donors, funders and supporters understand that this is part of the piloting experimental space. I think that’s what you’re seeing a lot of in social innovation — this openness to try new things, and understanding that sometimes those things are not going to work. Just like a venture capitalist fund understands that nine out of 10 businesses are not going to work. It’s that 10% that are going to work. What’s the cultural dimension of social innovation? When you look around at your peers in the space, what is the common thread in the way they are and how they think about things? Renyi: The common thread that I see with people working in social innovation is they all have different backgrounds. More traditionally, people who work in a charity have a certain profile — they’ve studied development, they’ve had a certain career. People in business have a certain career path and study path, whereas in social innovation, you find people from all kinds of sectors, from the sciences, to development, to business. The uniting factor is wanting to do good in the world. It’s all driven by the desire for social impact. I came to this world in the most secure way, starting in the business world, and then going to the more traditional non-profit world, and finding myself kind of in the middle. I appreciate both sides but I think that there are many ways in which you can integrate social good and social innovation into businesses, into the way businesses operate. I think that charities and non-profits could use business operation efficiencies in the way that they serve their clients. What I find in the space of social innovation is like-minded people from that perspective, that people can see the applications from different fields, and sort of cross-pollinate, if you will. But at the end of the day, they’re always driven by this social impact – their ultimate cause. When you go to a social innovation party, what are people like? Renyi: When I go to a social innovation party, it’s tons of fun because people are so passionate, and really interesting. I always learn something. You find these sometimes very intense people. They’re people who get you thinking about things differently. That’s always exciting. So unlike more traditional work cocktails, where sometimes you like to talk about work, sometimes you prefer to talk about other things, somehow social innovation transcends everybody. Everybody loves talking about what they do because it’s part of who they are. Do the small experiments in social innovation add up to big change? Can they ever do that? Renyi: I’ve heard from Peter Singer of Grand Challenges Canada about this notion of what he calls pilotitis, which is this idea of doing all these pilots all the time at small scale, and all these organizations wanting to get into social innovation, and getting stuck at that pilot level and not being able to really scale up. I think we’re now at a phase in social innovation where we need to keep piloting. That’s part of the innovation process, but we also need to start taking a lot more things to scale. How do we take things to scale when governments are giving less to aid internationally? I think part of that answer — I don’t think it’s the entire answer, but part of that answer — is unlocking private capital. When you look at impact investing, for example, the whole concept of impact investing is this: imagine if you could take this vast pool of capital that you have around the world, and invest in a way that would fundamentally transform the world. That would really help also unlock funds towards things like taking social innovation to scale. I think that’s part of it. But I think there’s also something that we have to be a little careful of in social innovation. It’s not just because something is new and cool that it’s better. Sometimes the things that have been done for a very long time, and have been done well, also deserve attention. And I sometimes worry that some things will not get funded anymore because they’re not so new and innovative, when in fact, they do tremendous positive work in the world. Those things should not be left behind. We should keep scaling the things or doing the things that have worked for a very long time. I would mention one more thing on that point — collaboration. You know, in our case, for example, as a non-profit, we’re really a catalyst organization. We’re really good at coming up with new ways of doing things — new models, new thinking. We then pass that on to NGOs in the field. We’re not in 65 countries, and we haven’t been in 100 countries like some of these much larger NGOs. We really see that part of our scale-up is collaborating with these NGOs. How can we scale through them? That’s what we look for. Right, you don’t just need to build this megalith organization for the purposes of building organizations. Is there something that you see people misconstrue or misunderstand about social innovation that you want to set the record straight on? Renyi: I’d like to set the record straight that social innovation is not just a term for NGOs and charities. I think it applies to everything. It applies to businesses, it applies to research institutions, it applies to governments. I think that’s what I’d really like to share with the world. I fundamentally believe that at least 95% of people on this Earth are driven by social good, in one way or another. Social innovation transcends organizations in all these sectors.